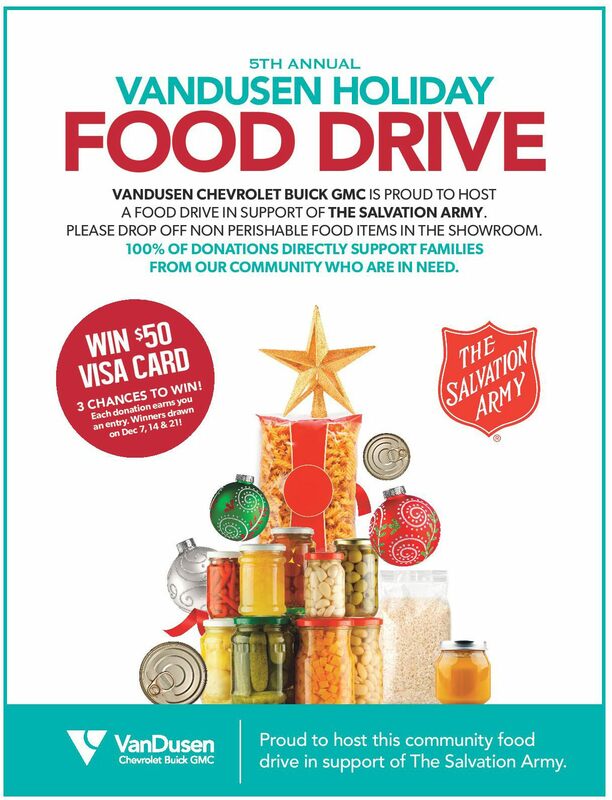 With the Holiday Season beginning, it is time for our 5th Annual VanDusen Holiday Food Drive with the Salvation Army. Throughout the year our VanDusen Team looks to give back to our community and this is one of the many ways we do it. Many people are less fortunate and do not have some of the most basic essentials such as food in everyday life. We have 3 large red Salvation Army Bins located throughout the showroom for all employees, customers and friends to donate any non perishable food item in. As a token of appreciation and a chance to win, every single item food donation from any employee, friend, or customer we will have their names entered into a draw. The draws will take place December 7th, 14th, and 21th and will be for a $50 pre-paid Visa card. There is no limit on the number of entries entered to win. 1 food item equals 1 entry. Please see reception for ballots to enter into the draw. Let’s really make a difference for many less fortunate families within our community and try and fill the bins!